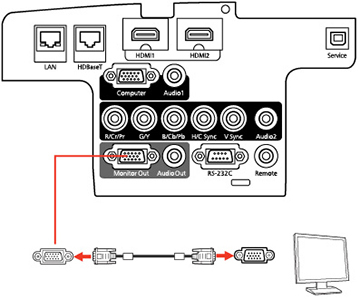 If you connected a computer to the projector's Computer or BNC port, you can also connect an external monitor to the projector. This lets you see your presentation on the external monitor even when the projected image is not visible. If you want to output images to an external monitor when the projector is turned off, you need to select Communication On as the Standby Mode setting and Always On as the A/V Output setting in the projector's Extended menu. Note: Monitors that use a refresh rate less than 60 Hz may not be able to display images correctly. Make sure your computer is connected to the projector's Computer or BNC port. Connect the external monitor's cable to your projector's Monitor Out port. Note: If you do not see an image on the external monitor, you may need to change the Monitor Out setting in the Extended menu.